Quilting is always fun and it can be extremely rewarding. However, like anything else, there are some downfalls. The collection of crazy scraps that we end up with can become frustrating because they pile up so much. It would be great if we used every piece of fabric during every project, but that’s not realistic. Today’s tutorial is brought to us by Angela Walters from The Midnight Quilting Show and it’s called No Leftover Fabric Quilt Pattern. The point of this pattern is that it uses as much of the fabric as possible, not really allowing any leftover fabric to add to the scrap collection, though these are a few little pieces that are small enough to just toss. The pattern requires fat quarters and Angela uses some beautiful colored fabric by Sarah Ruiz, called Pathfinder. It has both dark and light colors to create this contrasting effect that makes the quilt stand out. The quilt itself almost has the look of a flying geese pattern. Before we jump into the project, it’s important to gather a few materials first. The most important thing is obviously the fabric. The pattern calls for fat quarter blocks so a pack of those will suffice. Next, we will need our rotary cutters and measuring boards, pretty much the basic quilters tools. 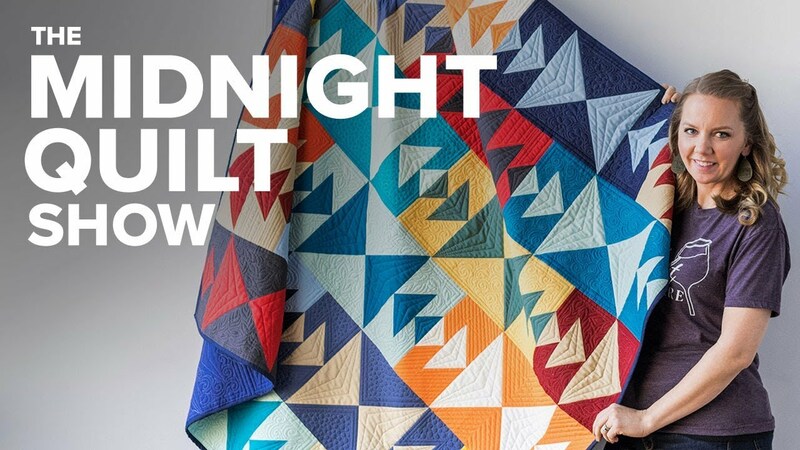 Angela does an excellent job explaining everything and I would say that the no left over fabric quilting pattern is beginner friendly. Don’t forget to check out the helpful tutorial video and have fun!